The name "hognose" refers to several varieties of colubrid snakes with distinctly shaped snouts that give them their name. These snakes are fairly small and can be difficult to feed in captivity but they are often found in homes as pets. Hognose snakes tend to be timid, and they prefer to hide from predators in the wild. The dramatic home behavior of most hognose snakes mimics that of a small cobra when they feel threatened: they flatten out their necks, raise their heads, and even occasionally strike, but rarely bite. They have rear fangs and can grow up to be fairly calm when handled regularly. These are definitely strange little snakes but they make interesting pets. They are low maintenance and small and also are diurnal (active during the day). There's some ongoing debate in herpetological circles about whether hognose snakes should be classified as poisonous. Technically, they do secrete a venom in their saliva that is lethal to small prey animals, but harmless to humans. And since hognose snakes don't typically bite, it's unlikely that a human would come into contact with that venom anyway. For these reasons, most snake experts don't consider hognose breeds to be on the same level as poisonous snakes like rattlesnakes and cobras. But the debate rages on. Hognose snakes have unique snouts that act as little shovels. They use their noses to dig into the ground and also like to burrow in humus (natural compost) in the wild. In captivity, it's best to provide them a few inches of sand mixed with reptile safe soil or another material that allows the hognose to burrow and hide. Hognose snakes don't get very large so a tank that allows them to stretch out the entire length of their body without one end touching the other end will suffice. Although these snakes don't typically climb, a secure lid is still recommended to keep your snake safe in its tank or other enclosure. A water dish big enough for your snake to climb into and a hide box are really the only other accessories needed in your hognose enclosure. Some owners opt to provide full spectrum, UVB lights on a 12-hour cycle but it is not completely necessary. A good temperature gradient should be provided with a basking area reaching 85 to 90 degrees and a cool side not dropping below 70 degrees. To achieve these temperatures you may need to experiment with different wattages of heat bulbs at varying heights. Remember to read the temperature at the level of your snake in the enclosure, not at the top of the tank (where you snake will never reach) for an accurate reading. Hognose snakes, especially Heterodon platirhinos, can be difficult to feed in captivity. In addition to staying consistent with what and when you feed, make sure the cage temperatures are where they should be and consider adding in a UVB light if you are really concerned. Hognoses will start out eating gut loaded crickets dusted with calcium powder but will graduate to pinkies, fuzzies, and possibly adult mice, depending on how large your species grows. Younger hognose snakes only need to be fed a few times a week, and fully grown hognose snakes do perfectly fine being fed one prey item a week. If you notice your snake is about to begin shedding, it's sometimes wise to reduce feedings to prevent regurgitation. There's little doubt when a hognose snake is hungry; they'll often approach their feeder with mouth open, ready for their food. Make sure to ask whomever you purchase your snake from what it had been eating, how often it usually eats, and the last time it ate and defecated. Ideally, you'll want to get a captive-bred hognose snake from a reputable breeder, who can answer any questions about health problems. It's up to you to decide whether you want an adult snake or a hatchling. If you have limited experience with snakes, you may want to choose the hatchling so you develop an affinity with it (and it with you). You can pretty much guarantee it's been captive-bred, and you'll have a better idea of its exact age. A healthy snake's ribs should not be visible, and it shouldn't have any noticeable kinks in its body when it stretches to its full length. And you should check its skin for mites or ticks before agreeing to take it home. 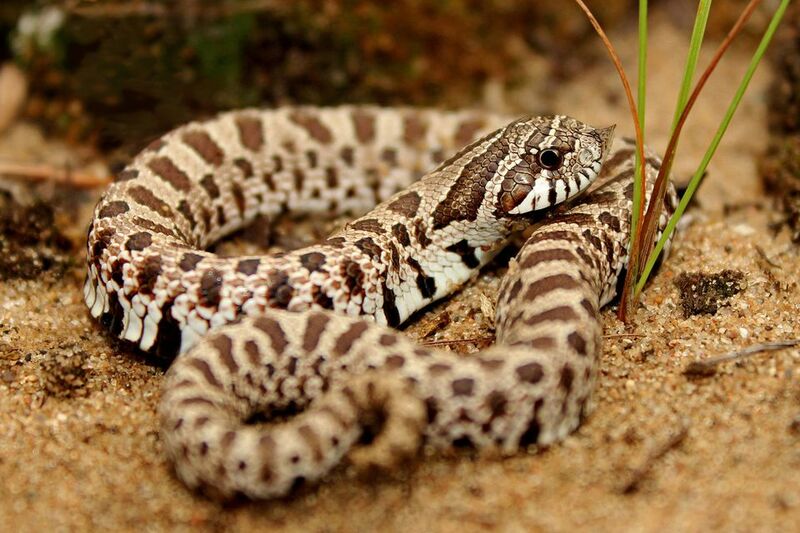 Despite their timidity around predators, hognose snakes are a hardy breed who don't often get sick. But there are a few diseases to watch out for. Like most reptiles, hognose snakes are susceptible to respiratory infections, which show symptoms of wheezing, drooling and general lethargy. It's believed that improper humidity is usually the reason for recurring respiratory infections in snakes. Another ailment that afflicts snakes is mouth rot, or infectious stomatitis. If you spot saliva bubbles and inflammation around your snake's mouth, those are classic symptoms of mouth rot. It's a painful condition and if left untreated could cause an infection that makes your snake's teeth fall out. Hognose snakes also are prone to fungal infections, which may cause problems shedding and discoloration of the skin. All of these conditions should receive attention from a veterinarian who specializes in reptiles. If you're still deciding which snake breed is right for you, check out our profiles of other snake breeds.